After looking at the app bundle with PhoneView and failing to find anything interesting there, I fired up Charles Proxy to have a look at the app’s traffic. The good news is Simple appears to be sending everything over SSL. This means that if, for instance, you’re at the airport and your iPhone is on an open wi-fi network, an attacker will just see encrypted garbage if they look at the traffic going between your iPhone and Simple’s servers. Now the bad news. 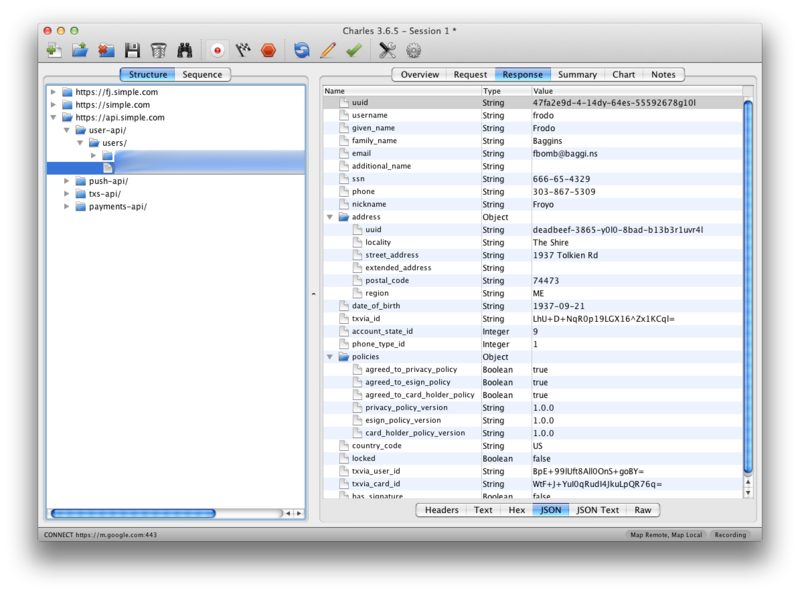 Charles Proxy has a wonderful option called SSL proxying. SSL proxying is handy for debugging when your app’s traffic is encrypted, but you want to see the contents. The first issue I noticed with Simple is it doesn’t take any steps to make sure it’s talking to its own servers. SSL guarantees that your connection is encrypted, but it doesn’t necessarily guarantee who is on the other end of that encrypted tunnel. Without the app validating that it’s talking to the server it should be talking to, it’s possible for an attacker to perform a man-in-the-middle attack. Editor’s Note: In iOS (and any modern web browser), there is a list of trusted CAs that is bundled with the OS. These CAs are who issue SSL certificates. When an SSL connection is established, if the SSL certificate’s URL does not match the URL that a connection is being made to, a warning will be raised and the connection will fail. This means that a malicious attacker can’t use his SSL certificate that he may have acquired for fakebank.com to perform a MITM attack with requests that are going to https://simple.com. Some sort of compromise of the chain of trust in SSL would have to take place, like a CA being hacked and generating a phony certificate for Simple’s servers. When I originally said that Simple doesn’t take any steps to make sure it’s talking to its own servers, what I meant was it’s not performing any validation outside of what SSL inherently gives on iOS. There is an additional step that can be performed that is called SSL pinning. With SSL pinning, the app can take matters into its own hands to perform additional validation on who it’s talking to, rather than relying on the more general list of trusted CAs. This would ensure that in cases like a CA being hacked, there would be an additional layer of security by the app to validate it’s still actually talking to Simple’s servers. However, it’s worth emphasizing that without such a compromise taking place, user data is encrypted and secure with Simple’s app. All data is going over an SSL connection, and some compromise of SSL would need to occur for this data to be at risk in this scenario. Normally the way SSL works is the client will setup an encrypted connection with the server before sending data to it. The way a man-in-the-middle attack works is the attacker intercepts your communications to the server and the server’s communication back to you. The client has an encrypted tunnel set up with what it believes to be the server. The server has an encrypted tunnel set up with what it believes to be the client. In reality both are just talking to the attacker and the attacker relays the traffic on after it’s able to take a look at it. A MITM attack isn’t extremely likely on iOS because iOS ships with a list of trusted SSL certificate authorities. Using an app like Charles Proxy, you use a self-signed SSL certificate which iOS won’t trust unless you explicitly tell it to. That said, SSL is not foolproof and there have been instances in the past of it being exploited, and even of attackers creating phony SSL certificates signed by a legitimate and trusted CA. Ultimately this isn’t something users have to worry about too much, but it is something Simple should fix. The app should be making sure it’s talking to Simple’s servers and Simple’s servers should make sure that it’s really the app that’s talking to them. What’s more interesting is what you find once you start looking at Simple’s traffic. Since Simple isn’t doing any certificate pinning, we can enable SSL proxying in Charles and watch the traffic that Simple is sending and receiving. The first thing that jumps out is the request to https://api.simple.com/user-api/mobile-auth-tokens when you sign in to your account. Included in the request are your plaintext username and plaintext passphrase. The request is sent over SSL, but this doesn’t guarantee security and when dealing with such sensitive data, more security measures should be taken. To be fair, up until this point, I haven’t seen anything that Simple is doing wrong that other banks are doing right. Of the two other banks I have accounts with, neither do pinning of SSL certificates or have any additional security to protect your username and password when signing in. So far Simple’s behavior seems par for the course. So far their security is just as disappointing as my other banks. But wait, there’s more… There’s another request sent when you sign in: https://api.simple.com/user-api/users/UUID. The body of the request isn’t all that exciting, but the contents of the response are. It seems to include all of our personal info including full name, email, street address, date of birth, and social security number. Yes, your social security number. Simple’s server is sending all of this data back to your app when you log in, and as most of this info doesn’t seem to be used by the app anywhere, it’s unclear why they feel the need to send it. My apologies for not responding sooner; we did receive your report and I’ve discussed the issues you’ve raised with the team. We are continuously working to improve the security of our solutions, and you can expect to see steady improvements as we continue to build out our platform. The challenges with ensuring the effectiveness of SSL are well-understood and under constant review inside the organization. In addition, it does look like we are transmitting more data than we absolutely need to and that is something that we are actively working to improve. Thank you again for your message, and please do not hesitate to contact us again. We also provide a GPG key for communicating security issues with Simple on the Security page at www.simple.com; please feel free to use that in the future if you are able. So it sounds like maybe they’ll fix this at some point… or maybe not, I’m not sure. I’ve seen restaurants respond with more urgency when they screw up my hamburger. For a company that I’ve entrusted with my personal and financial data I expect them to treat security with the utmost importance. I expect them to fix security oversights as quickly and apologetically as possible. Since the company does not seem to share my enthusiasm there, I felt that the responsible thing to do was inform other users of these shortcomings so that they can make an educated decision on what to do with their own accounts. I’m still hopeful that eventually Simple will fix these issues, but in the meantime their users deserve to know how the company is handling their information. 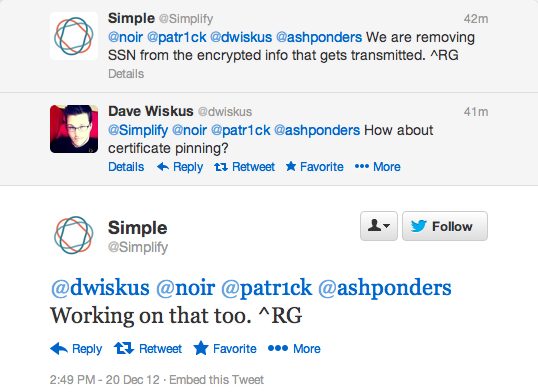 Update #1 12/20/12 3:00PM – Simple has responded to several users on Twitter in order to try and address their concerns. Happy to see them actively responding to users and looking forward to seeing the issues actually fixed. Update #2 12/21/12 9:00AM – I received a tweet from Brian Merritt, the Director of Engineering at Simple, asking if I’d be willing to give him a call and talk. Good news. The SSN issue has been fixed as of last night. If you go look at your traffic now, your SSN is no longer being sent back by the server. Brian also reassured me that the SSL certificate pinning is an issue that they were aware of and have been working on. Unfortunately that sort of fix will require an app update, so it’s something we’ll have to wait on, but it does indeed sound like the fix is coming. I’m glad there are people like you in the world. Because of your findings, you have potentially made a great service even better. Thanks. How does one go about validating SSL certs? I know my app doesn’t allow self-signed certificates: is that enough? Can you elaborate on “certificate validation”? You mean that Simple is not verifying that the CN on the certificate matches the name of the server? Poke Her? You Hardly Know Her!